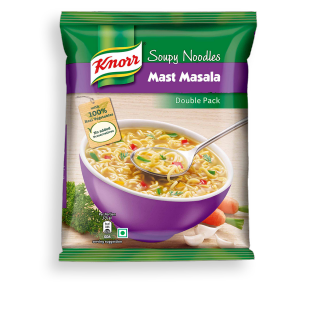 Knorr Soupy Mast Masala Noodles has the goodness of soup along with the fun of noodles, making it a fun evening snack for kids. Knorr Soupy Noodles are spicy and slurpy and make for a tasty meal. What's in our Mast Masala? 1. Pour 300ml (approx 2 cups) of water in a pan, add noodles & entire contents of soup powder, mix well. 2. Bring to boil and simmer for 3 minutes. Stir occasionally. 3. Do not dry the noodles completely. Serve hot as SOUPY NOODLES. 4. Chef's Tip: Add 1 cup boiled veggies for added crunch!